Porsche’s bound to reveal a plug-in hybrid Cayenne soon, which means Turbo S and GTS models will come in due time. Exercise patience when required. 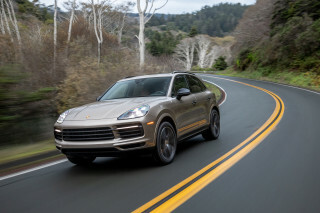 The 2019 Porsche Cayenne heaps astonishing performance into its tall-wagon crossover body. It’s a formula once thought to be heresy; now it’s old hat. It doesn’t venture too far down new styling roads, not from the outside. The Cayenne takes more risks in its ample cabin. Touchscreens and voice commands have sent pink slips to the hundred-plus buttons and switches that defined old Cayenne cockpits. The Streamliner effect makes sense of the Porsche SUV’s vast interior space, while it ratchets its chic quotient. It’s hard to find fault with the Cayenne’s trio of powertrains, single-turbo and twin-turbo V-6s and a twin-turbo V-8. A plug-in hybrid slots in between the Cayenne and Cayenne S on the pricing scale, but its performance tops both. Every Cayenne drops sub-6-second acceleration times. 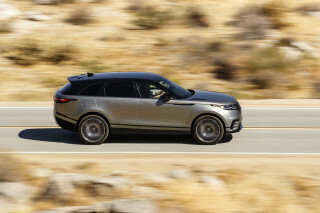 Most will come with a slew of adaptive electronic controls for everything from the 8-speed automatic and all-wheel-drive system to the available air suspension and adaptive dampers. In our early test drives, the Cayenne’s on-the-fly electronics stretch its performance envelope way beyond legal levels. It’s frighteningly fast, intently grippy, fluent on both smooth pavement and the uncivil roads where its off-road credentials come into focus. The Cayenne E-Hybrid's driving experience is little different, albeit with more immediacy to its responses and a slightly less-engaging brake feel. Porsche maxes out the Cayenne’s footprint with great interior space, and fills it with mandatory luxury features like automatic emergency braking and real leather upholstery. Base models price out from the mid-$60,000s and miss out on little; full-tilt Turbos press near $200,000 and offer panoramic glass roofs, truffle-brown leather with sweet-gum wood, cooled and massaging seats, and bang-on Burmester sound. At some point in the near future, the Cayenne will become the best-selling Porsche of all time. 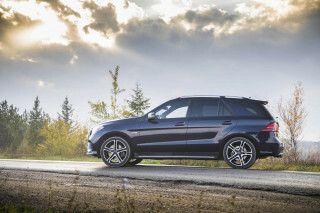 The only surprise: with SUVs as good as the Cayenne, why’s it taken this long? The 2019 Cayenne breaks no new ground from the outside; inside, it’s been beautifully streamlined. The 2019 Cayenne makes no dramatic departures from more than a decade of Porsche SUVs, but it’s grown more mature, while the interior’s ditched dozens of buttons to form a faultlessly sleek driving environment. Its shape is tamper-proof, completely in line with the 2002 original. It’s a bit bigger and more curvy than before, but you’ll have to look closely at the ribbed front air intakes and the slim LED taillights to tell it apart from previous versions. We see faint hints of Panamera in its fascias and in the more cohesive shapes that collect at the rear. Inside it’s a different story. A big high-resolution touchscreen and touch-sensitive controls have swept away most of the buttons and switches on the console. There’s a welcome simplicity inside that shows off the Cayenne’s leaner, more logical dash. Inside the gauge cluster, twin 7.0-inch TFT displays flank the tach, and toggle to display navigation with Google Earth maps, infotainment settings, and driver-information systems. The ignition’s still on the left of the steering column, a nifty heritage-tinged touch. The rest of the Cayenne’s cockpit and its command-and-control interfaces have a distinct leap-ahead feel. The 2019 Cayenne obliterates some acceleration and handling benchmarks that aren’t SUVs. 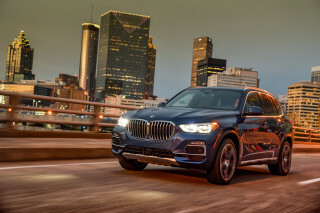 The 2019 Cayenne sports familiar Porsche powertrains with copious thrust, a slew of electromechanical handling aids, and a sense of poise and composure that’s unattainable by some sports cars we know and love. Each of the three powertrains on tap for the first 2019 Cayennes can push the SUV to 60 mph in under 6.0 seconds. Base models churn away with a 3.0-liter single-turbo V-6 that belts out 340 horsepower and 332 pound-feet of torque, for a 0-60 mph time quoted at 5.9 seconds (it’s 5.6 seconds with Sport Chrono, which remaps throttle and transmission settings for quicker responses). Base models top out at 152 mph. This single-turbo V-6 works hard behind a wall of acoustic glass to motivate the SUV’s substantial 4,377-lb curb weight. Tuck into a Cayenne S and its twin-turbo 2.9-liter V-6 ups the blast to 440 hp and 406 lb-ft. It’s a similar design, a slightly destroked V-6 with an extra turbo, so it’s not a surprise that it puts out slightly less torque while it pulses out 20 hp more than the previous twin-turbo V-6 Cayenne. Porsche pegs 0-60 mph runs at below 5.0 seconds, and top speed at 164 mph. The Cayenne S surge of authority gets handed its jock by the raucous V-8 roar of the Cayenne Turbo. Its 4,795 lb of heft gets offset by 550 hp and 567 lb-ft of torque. It slingshots to 60 mph in less than 4.0 seconds (3.7 seconds with Sport Chrono) and stretches its legs up to a top speed of 177 mph. 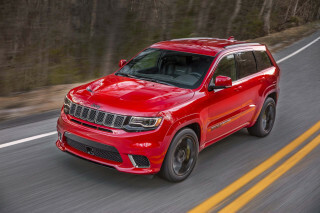 The speed’s great, but its whuffling V-8 exhaust seals the deal, even though by some claims, it’s not the fastest SUV on earth. The Cayenne E-Hybrid puts out a combined 455 horsepower and can run on electric power alone for nearly 27 miles, Porsche says. It furnishes ample power from any speed thanks to torque that peaks just off idle. With moderate throttle application, the E-Hybrid's electric motor provides decent grunt A subtle indent in the throttle pedal lets drivers know when they're reaching the electric-only powertrain's limit when the gas engine nearly silently kicks over. Every one of these powertrains moves power through a paddle-shifted 8-speed automatic and an all-wheel-drive system that can split power between the front and rear wheels, then again between the rear wheels when outfitted with the available torque-vectoring differential. Porsche’s AWD system biases power to the rear, in a progressively higher ratio in Sport and Sport+ drive modes. The meaty tires (summer rubber’s a must-have option) don’t look off-road ready, but the Cayenne can ford through 19.7 inches of water, and can hold oil pressure on a 45-degree incline. With the right tow packages, it can pull up to 7,700 pounds. 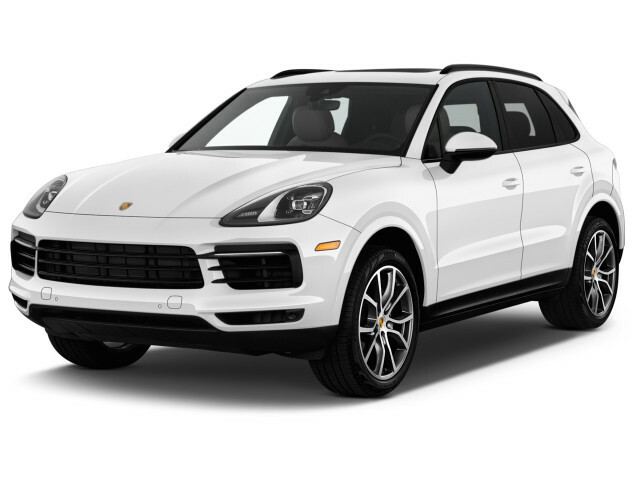 Porsche imbues the Cayenne with excellent handling and a firm ride, even the base SUV with a front strut and rear multi-link suspension, 19-inch wheels and tires, and electric power steering. With any powertrain, the Cayenne can upgrade to an air suspension with adaptive dampers, big 20- or 21-inch wheels with all-season or summer tires, active roll bars that cut down on body lean, and rear-wheel steering that betters its ability to park easily without voiding its high-speed stability. With the optional Sport Chrono package, the Cayenne gets a set of drive modes that change its mood from comfortable and economical to sporty, to thrill-seeker. So far, we’ve driven all the powertrains, but each came in a Cayenne fitted with torque-vectoring, summer tires, air suspension, and 21-inch wheels. The air suspension enhanced its ability to pick around rubbly Greek mountainsides, given that it increases ground clearance from 7.5 inches to 9.6 inches, and that it works with traction modes that help the tires grip through gravel, mud, sand or rock. On paved roads, the Cayenne can seem almost mellow, in its comfort settings. The ride and steering always have a certain degree of heft and stiffness, because it’s a Porsche and needs to feel more like a 718 or 911 than it does like, say, a Maybach. With all the optional systems, the Cayenne had almost no body lean, but the lighter amounts of compliance offered by the taut suspension and performance-minded tires created a lot of head toss. On the flip side, the Cayenne’s steering cuts a clean, telegraphic path on almost any road. The rear-steer setup lets it move the front wheels 3 degrees in the opposite direction of the rears at low speeds, and that helps it carve much tighter lines through very sharp corners (and, okay, in mall parking lots). It helps the Cayenne feel small, when by any objective measure, it isn’t. The Cayenne’s brakes are outstanding, even if you don’t get the spendy carbon-ceramic stoppers, a $9,080 option. Forget the Boxster’s tight confines: the Cayenne and comfort are Facebook-official. Porsche leans on the VW Group’s big-SUV architecture for the new Cayenne. It’s a cousin to the Lamborghini Urus and Bentley Bentayga, and that’s no bad thing. The Cayenne has wonderful cabin space, good utility, and exemplary fit and finish. The 2019 Cayenne seats five, just like the entry-level Macan SUV. In the Cayenne, there’s a lot more space, generously doled out to both front- and back-seat passengers. At 193.6 inches long, on a 113.9-inch wheelbase, and at 78 inches wide, the new Cayenne is about an inch wider and 2.5 inches longer than the last-generation Porsche SUV. It’s also three inches bigger between the wheels than the Macan, and that’s immediately obvious when you step into the Cayenne. In front, 8-way power seats sit in nacelles with inches of extra space in every direction; six-footers fit fine, even if the final build sheet calls for 18-way power seats with heating and cooling or the adaptive sport seats. The passenger gets a total of three grab handles, which sends the correct message, but they also get free rein over cupholders, a big center console, and a smartphone nook that has a built-in booster for wireless reception. The back seat in the Cayenne fits as many as three adults with ease–as it should, since the Cayenne isn’t much narrower than today’s minivans. The Cayenne’s big, and lacks for nothing in the areas of head and knee room. The seats have slightly less pronounced bolsters, but the step-in room is great, the seats recline through 11 positions, and can be heated. They also fold down for added cargo space, which rises 3.5 cubic feet in this generation. With the seats up, the Cayenne can hold 27.2 cubic feet of cargo. The seat splits into sections along 40/20/40 seams, so passengers can ride along with skis, for example. With the rear seats flipped forward, the Cayenne can tote more than 60.3 cubic feet of stuff (the total cubes are somewhat lower on Turbos). With no crash-test data, the 2019 Cayenne leans on lots of technology to bolster its safety credentials. Neither the NHTSA nor the IIHS has crash-tested a new Porsche Cayenne. Given its price and sales volume, it’s likely they never will. Meanwhile, the Cayenne soothes safety nerves with its myriad standard and optional features. All versions get a rearview camera, forward-collision warnings, and automatic emergency braking. Spend more, and the Cayenne adds touches like adaptive cruise control, active lane control, surround-view cameras with off-road modes, LED-matrix headlights, and night vision. The latest Cayenne rewards a careful hand on the configurator mouse–but Burmester sound and truffle-brown interiors, oh, my. The 2019 Porsche Cayenne never met an add-on it didn’t like. We give it bonus points above the mean for its plethora of standard features and custom-fit options, as well as one for its nifty infotainment system. We take one point back because it’s hard to conceive of even the base Cayenne as a value–but ultimately, that’s up to you, anyway. All Cayennes get leather upholstery, power front seats, LED headlights, navigation, satellite radio, 10-speaker audio, 19-inch wheels, and a 4-year/50,000-mile warranty, at a minimum. Even base SUVs can be configured with features such as 14-way power front seats, carbon-fiber cabin trim, a 6-CD changer (! 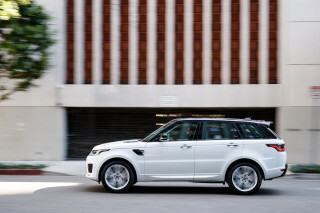 ), a tow package, an off-road package, adaptive suspension, and rear-wheel steering. The $83,950 Cayenne S adds 20-inch wheels and tires, the adaptive suspension, and a glass roof. We’d bundle those standard features with some options we love: mahogany metallic paint, 20-inch Cayenne Design wheels with summer tires, $7,210 worth of truffle-brown leather, sweet-gum wood trim, acoustic-damping glass, heated and cooled adaptive sport seats, all the adaptive driving systems, adaptive cruise control, surround-view cameras, and a $7,000 Burmester sound system with some of the purest, cleanest sound you’ll hear in a car. (Or an SUV.) Oh, and while we’re at it, a $140 fire extinguisher, and put the rest on a gift certificate. We spent more time mulling over the option and trim sheet than in figuring out some of its more exotic equipment. We’re all-in for $123,840, including $1050 in destination. Cayenne Turbos arrive later in the 2018 calendar year and have standard 21-inch wheels, heated front and rear seats, and an active rear spoiler, in addition to all the Turbo hardware and badging. With a base price of $66,750, the 2019 Cayenne pricetag can zip swiftly past $125,650, where Turbos begin. With every dollar-adding box ticked, including carbon-ceramic brakes and Los Angeles delivery, we came up with a $187,405 Cayenne Turbo, even before plug-in hybrids and Turbo S models flow through the pipeline. The latest Porsche infotainment system melds together steering-wheel controls, voice commands, and a gorgeous 12.3-inch high-resolution screen, as well as a screen inside the gauge cluster. All around the cabin, touch-sensitive controls have replaced all but a few of the usual toggles, switches, and buttons. The Cayenne’s screen designs are clear and filled with information, though maps still crowd into the landscape-oriented screen. Voice commands work better than before, and the Apple and Android alternatives work smoothly–and without an upcharge. The only thing average about the Porsche Cayenne is its fuel economy. The EPA says the 2019 Cayenne with the single-turbo V-6 checks in at 19 mpg city, 23 highway, 21 combined. The twin-turbo V-6 registers 18/23/20 mpg. A plug-in hybrid is on the way to join the Cayenne Turbo, but neither has been rated yet. We’ll update this page when more information becomes available.